A big THANKYOU to all who came to my classes last week. 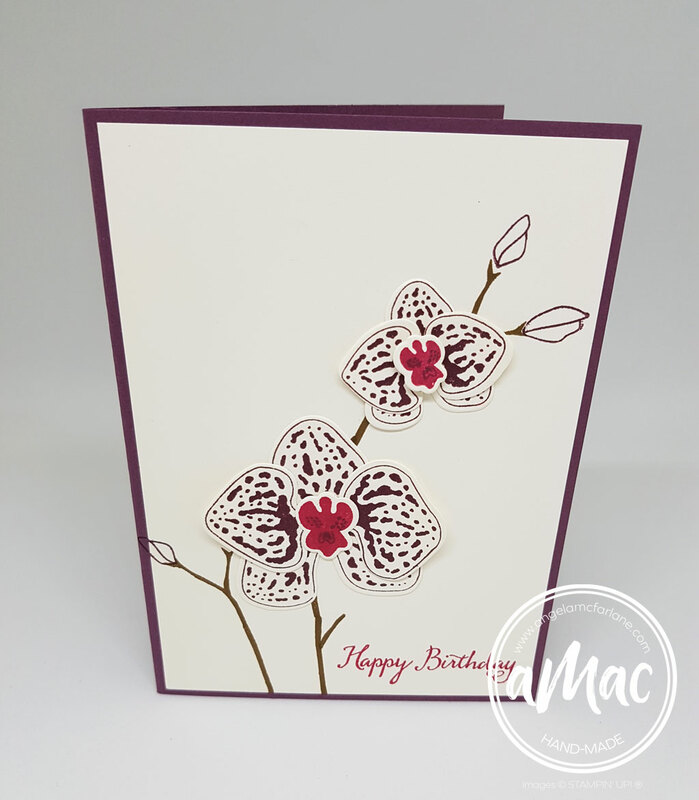 We made four cards using the Climbing Orchid stamp set and Orchid Builder matching Framelits. This beautiful set has carried over from the last catalogue. I bought it a long time ago but only got the chance to play with it recently. 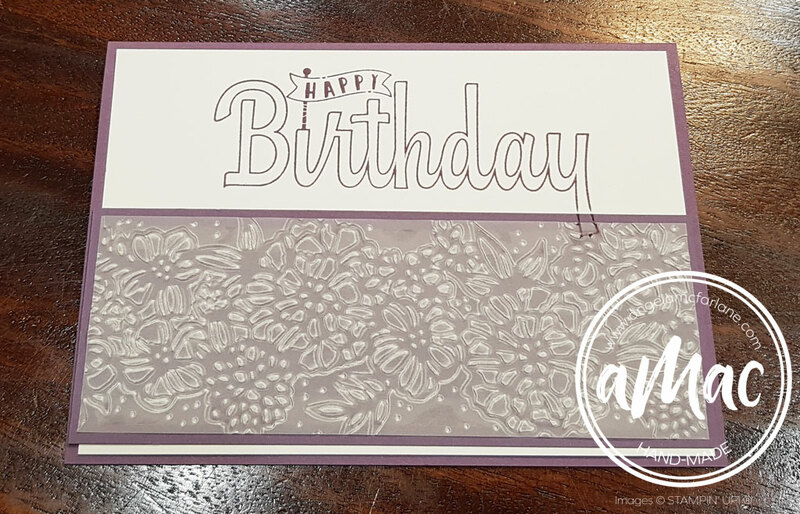 The first card I cased from “Short Cake Scraps”. 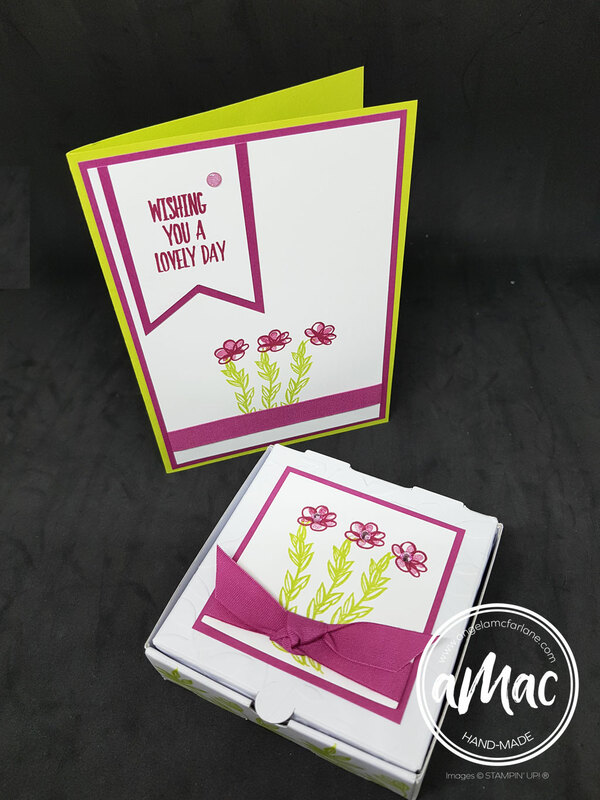 We used the double layered stamp to create this lovely card. 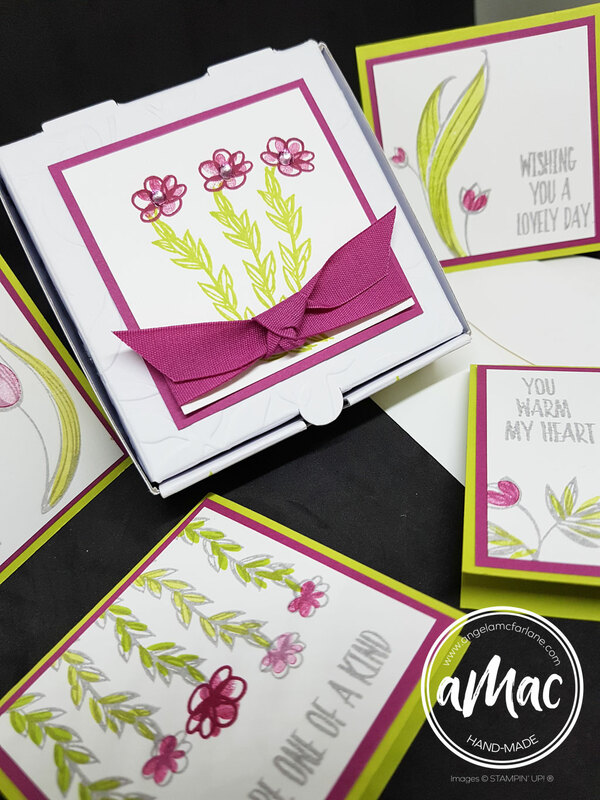 The card base was made using Fresh Fig card stock and card front was on Very Vanilla. 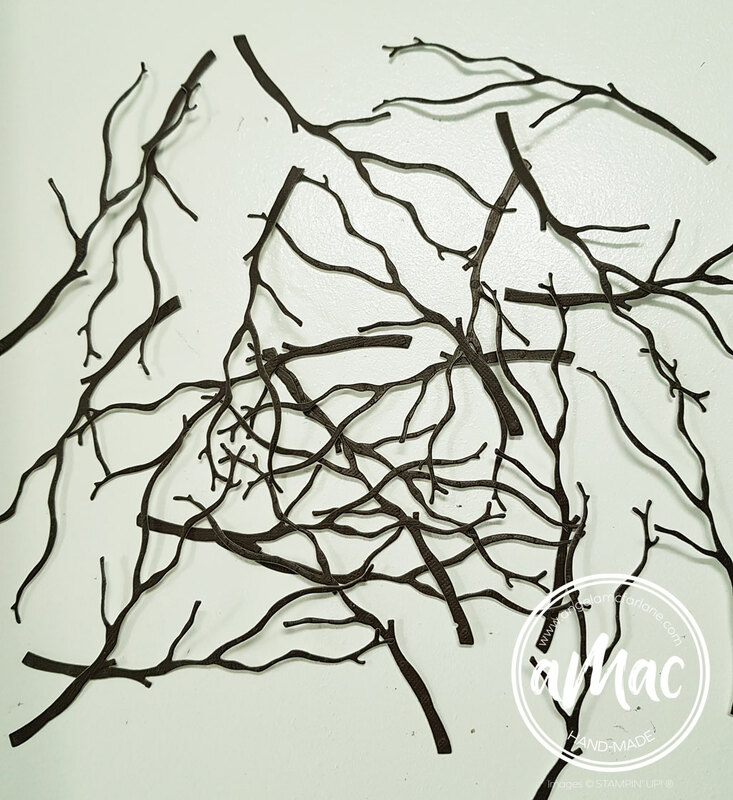 The branches were stamped using the new Stamparatus positioning tool. 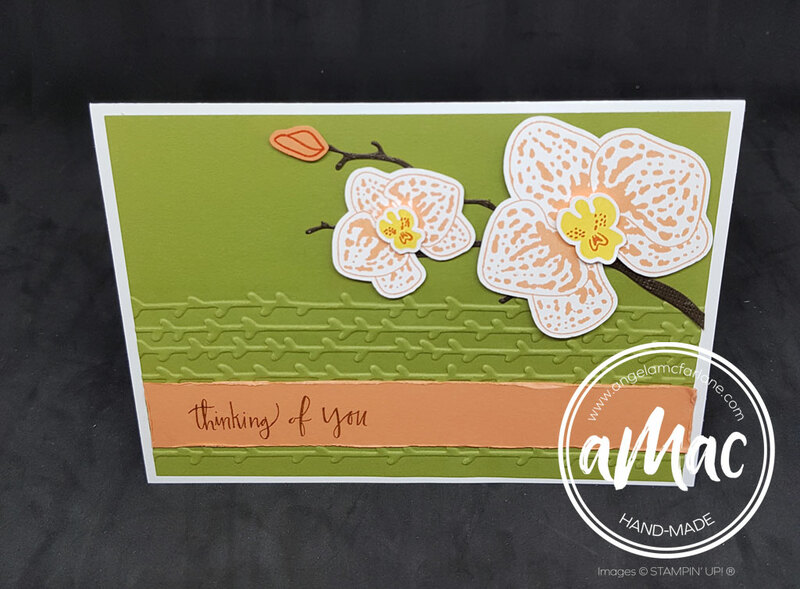 The second card was inspired by a card in the new 2018-2019 Stampin’ Up! catalogue (pg. 24). 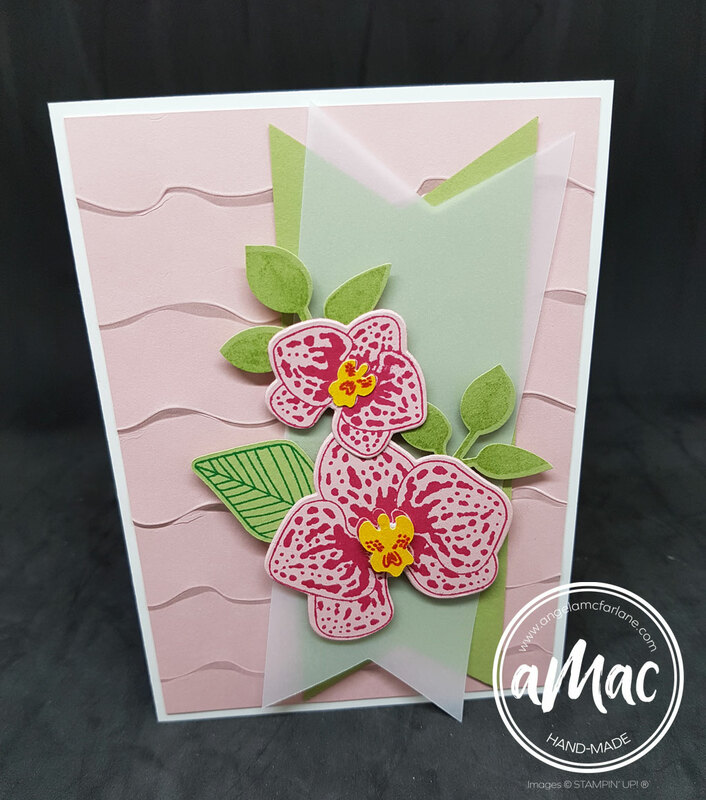 I used blushing bride for the card front and stamped the orchid in Melon Mambo ink. 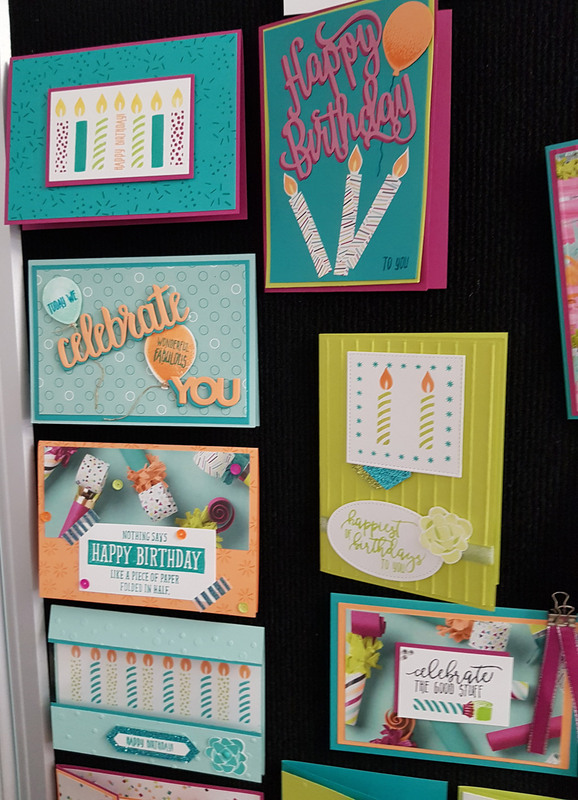 The Ruffled 3D dynamic embossing folder created a beautiful background. The third card is my design. I think the Old Olive matches so well with the new in-colour Grapefruit Grove. Everyone had their own choice of greetings. ‘Thinking of you’ covers a lot of occasions. 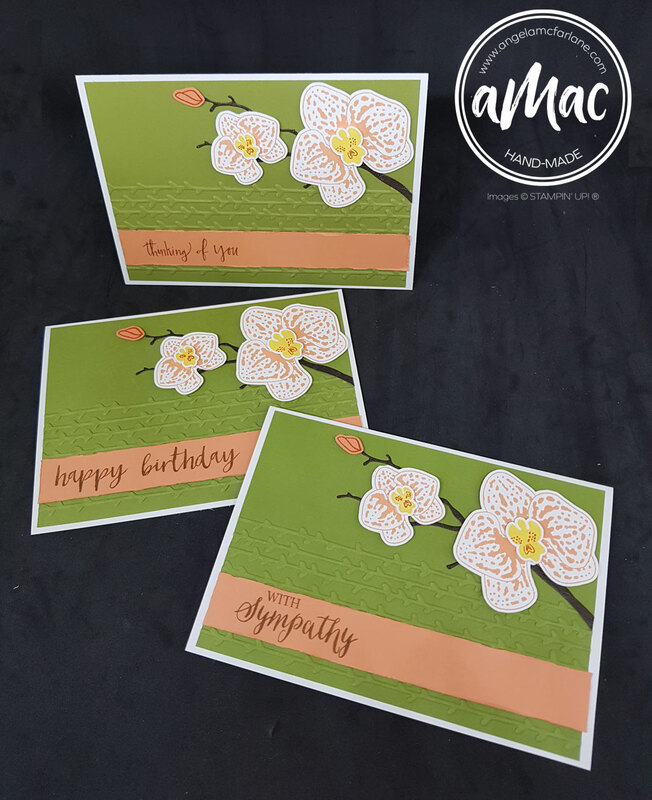 The fourth card was inspired by a card on pg 21 of the 2017-2018 catalogue. 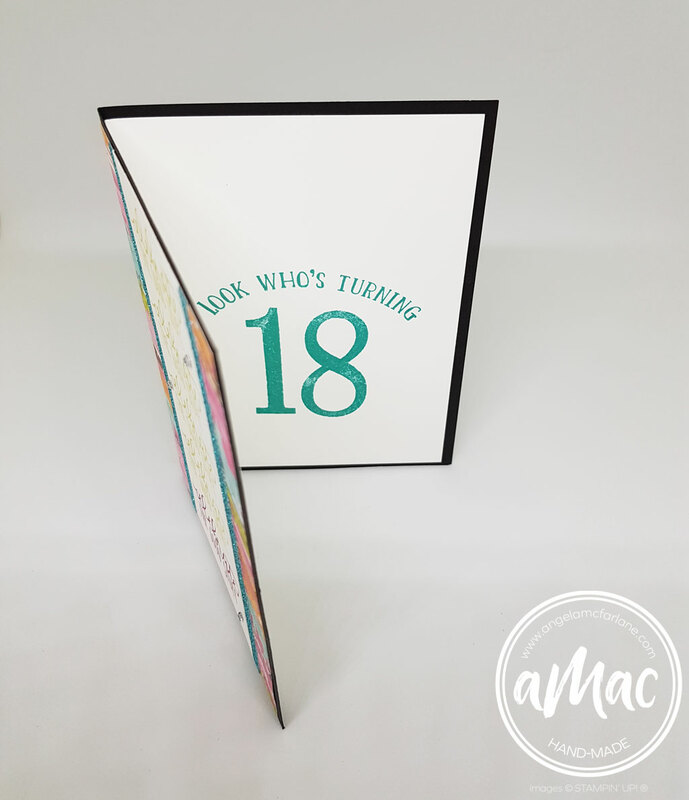 We distressed the edges of the card front for a little extra texture. The branches were stamped using the new Stamparatus positioning tool. 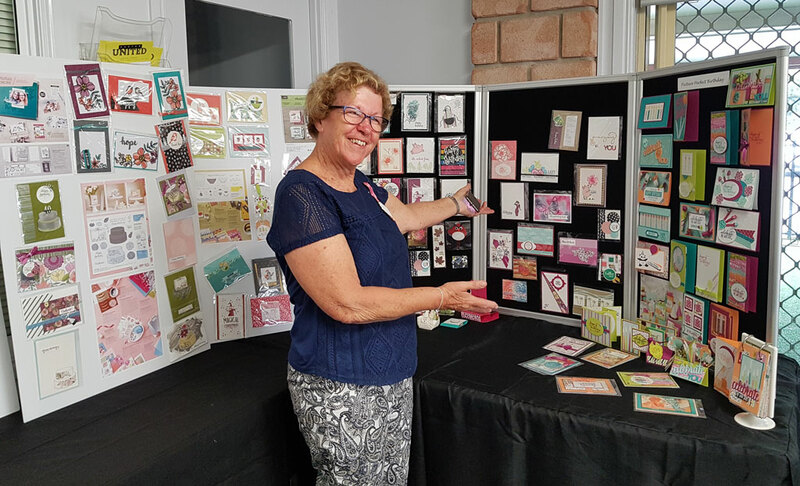 Everyone loved the cards they created and are looking forward to the next class. If you would like to join us, please see the class schedule. There won’t be a July class as I will be away but we’ll be back on deck in August. 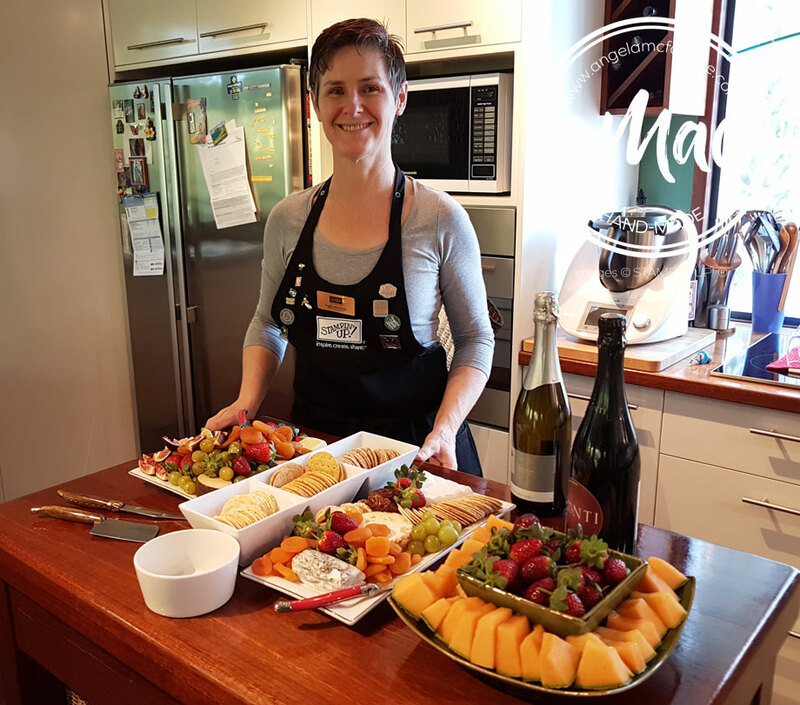 The next event is 17 June for my Wine and Cheese Fundraiser and New Catalogue launch. Please join us for a fun afternoon or crafting, displays, raffles and of course, get your new catalogue. I am fundraising for Ronald McDonald House Charity again. Please come along to support this worthy cause. Or contact me to help you with an order. 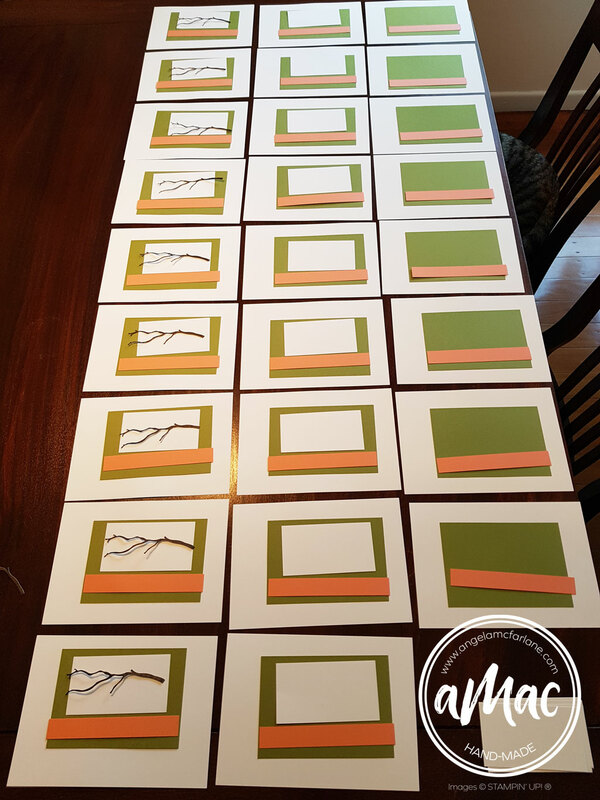 Here’s a behind the scenes look at prep for just one of the four cards for this week’s classes… Looking forward to it! 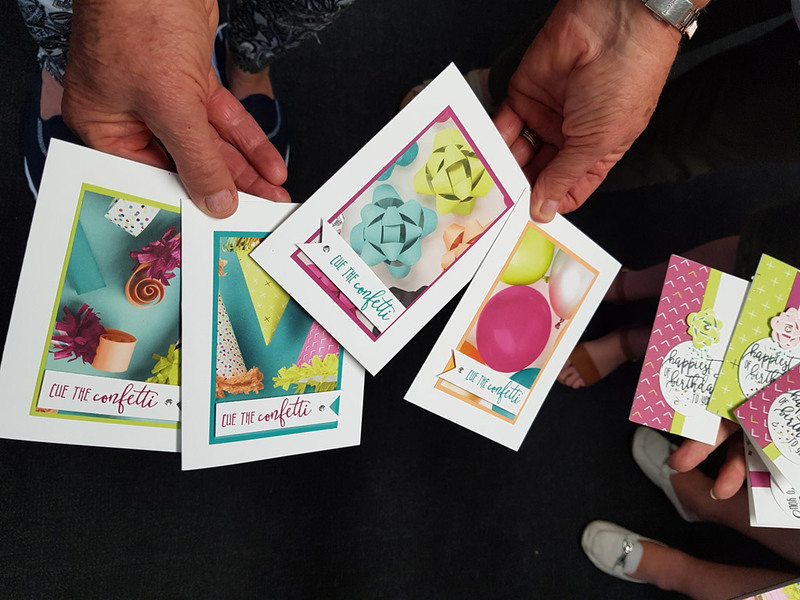 I held three classes last week featuring the Birthday Wishes for You stamp set. Thank you to all who came, we had a fun time creating together. Instead of a lucky door prize, everyone got to take the stamp set home! 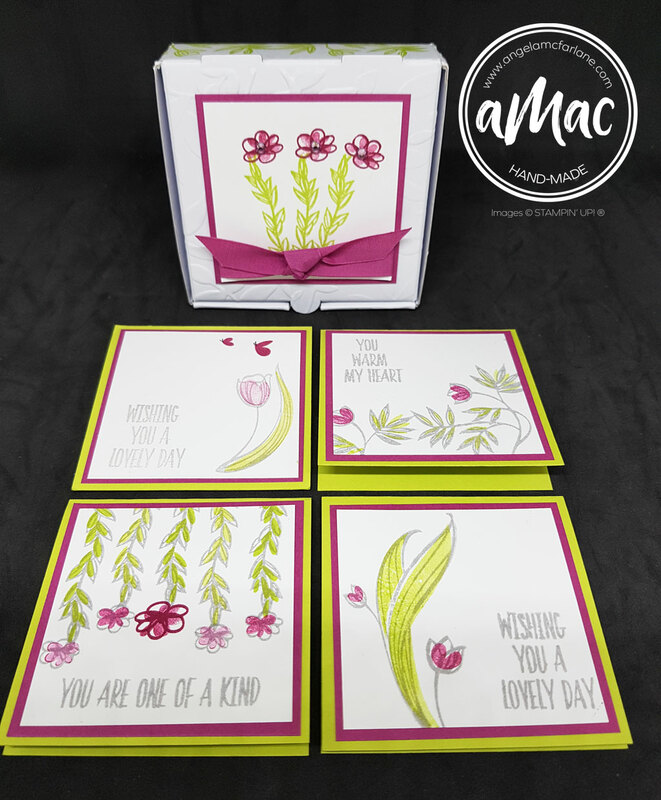 The cards we made were cased from Anna Wheaton and Bec Ross. 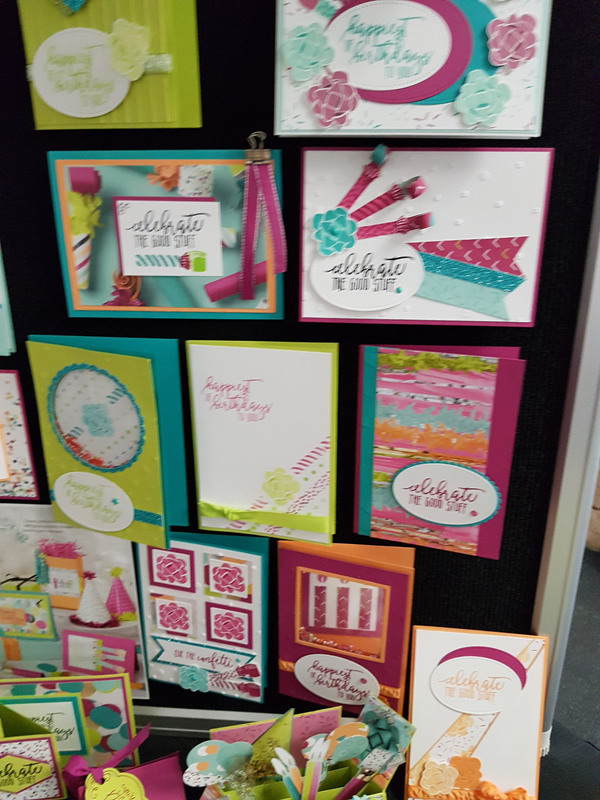 We showcased the stamp set using 3 different techniques. 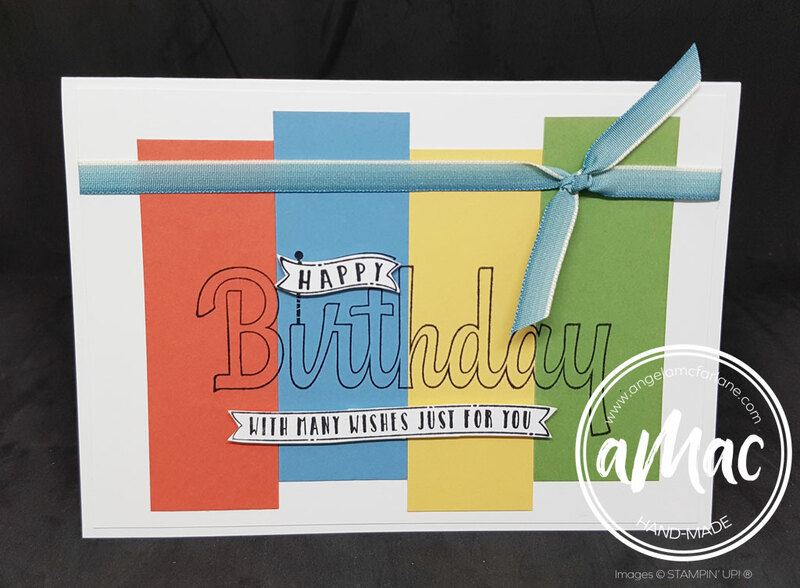 This first card uses the Stained Glass Technique. 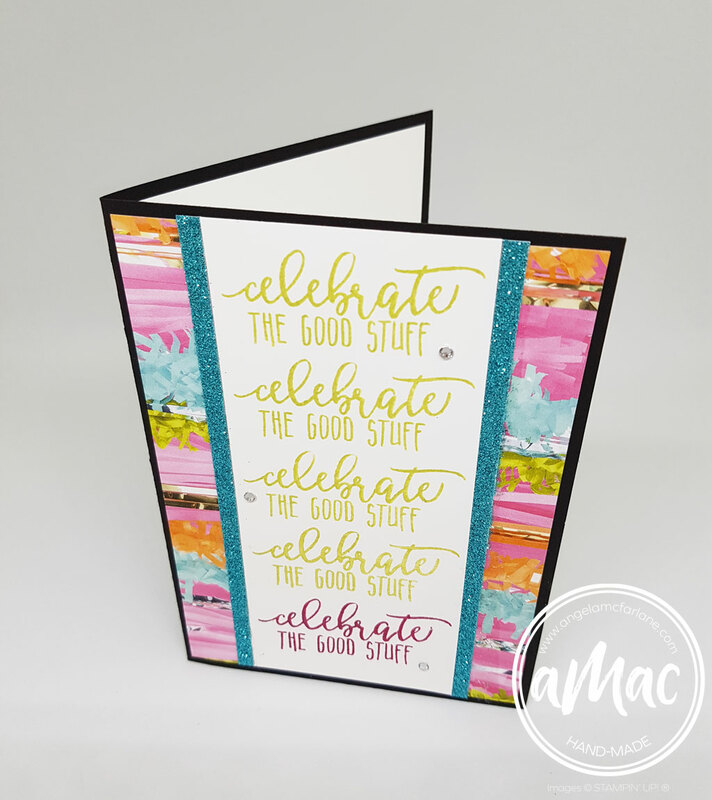 The sentiment is stamped in Versamark and heat embossed with Copper Embossing Powder. 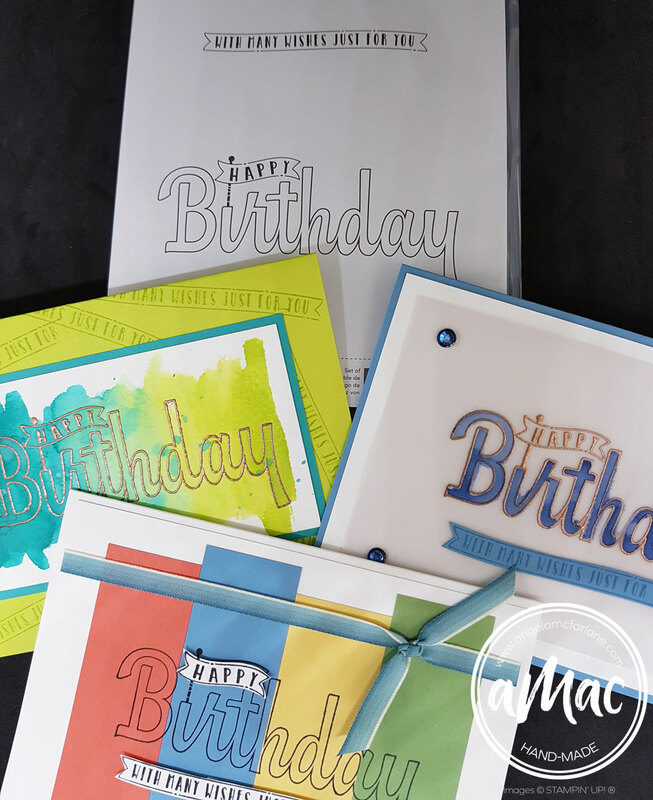 The wording is then coloured using Stampin’ Blends. 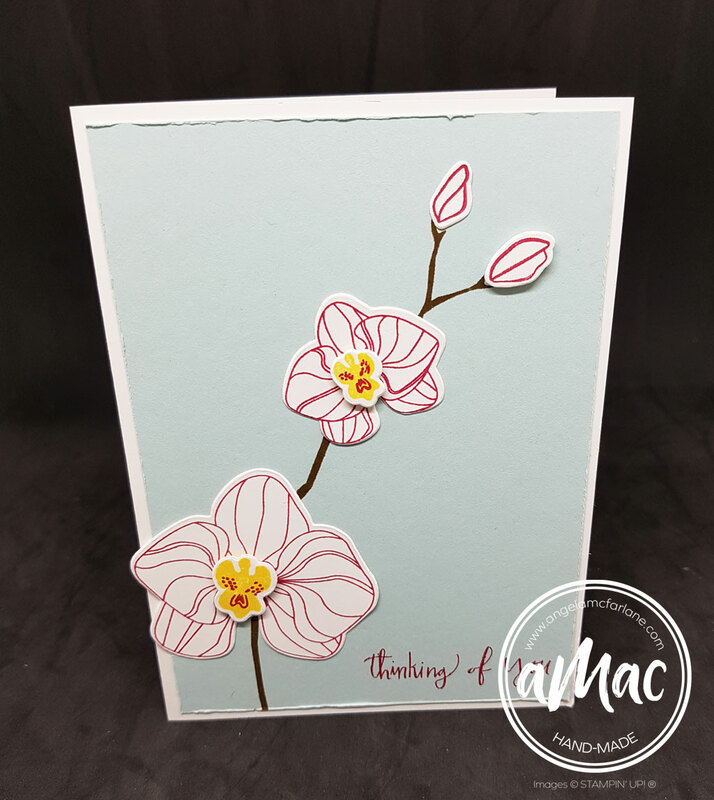 Since many adhesives show through vellum, we used 4 glue dots to attach it to the card front, then they were hidden with Rhinestones coloured with Stampin’ Blends. 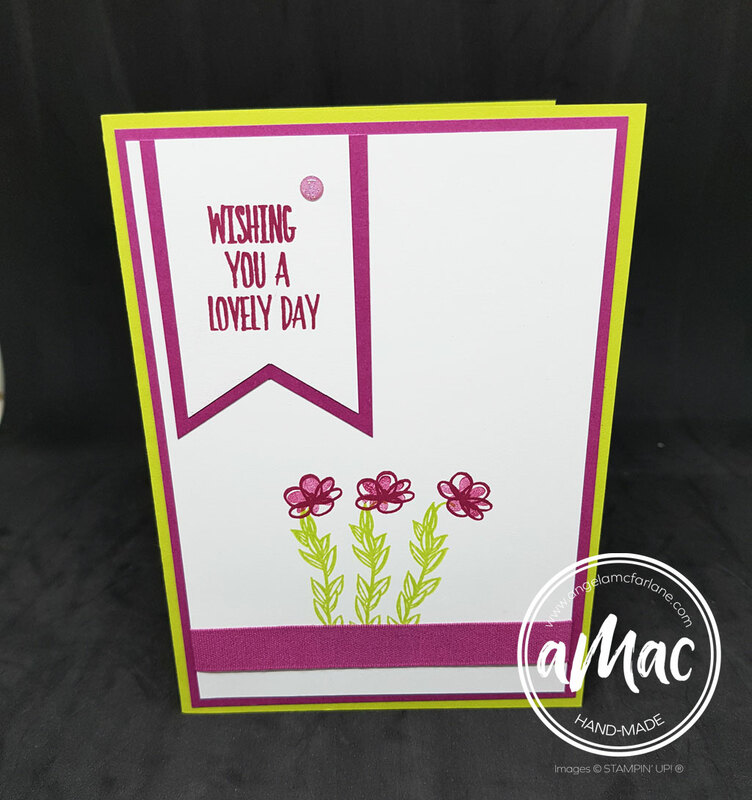 The second card we made used the Watercolour Background Technique. 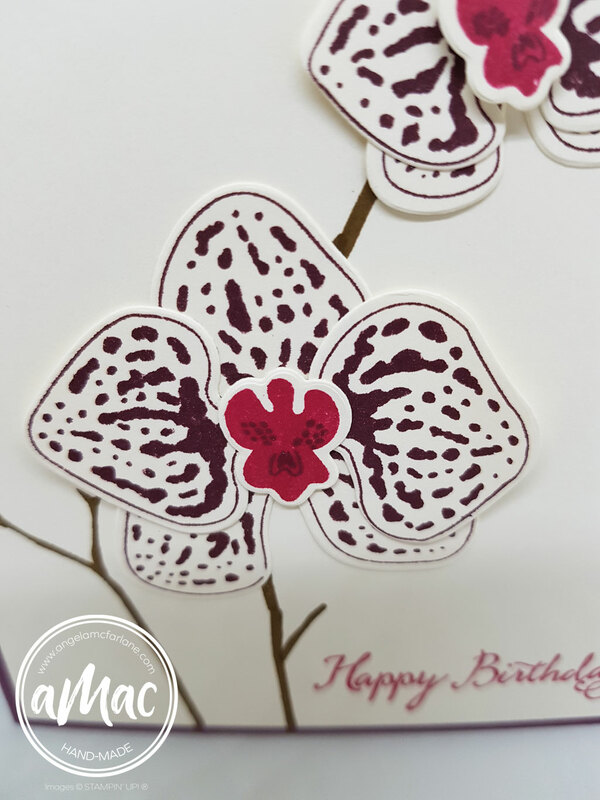 We embossed the card first using Copper Embossing Powder. 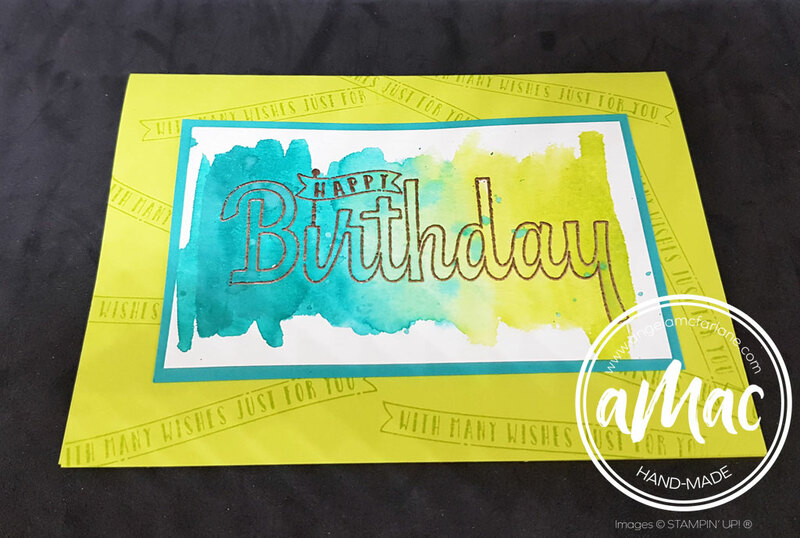 The background uses Bermuda Bay and Lemon Lime Twist ink ‘swooshed’ on with an Aqua Painter. 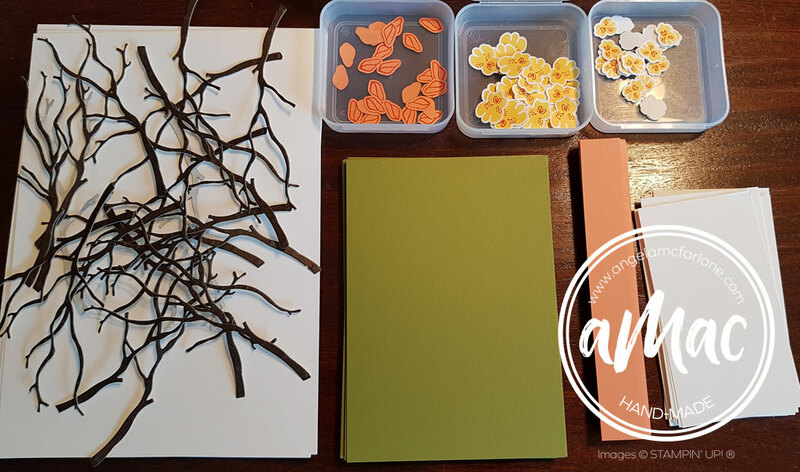 When this was dry, we used the darker ink by picking it up with the Aqua Painter and flicking it onto the project. The third card was made using the Patchwork Technique. This is great for using up pieces of off-cuts you may have. The pieces measured 3cm x 8.5 cm and they were stuck onto a Whisper White piece (10cm x 14.3cm). 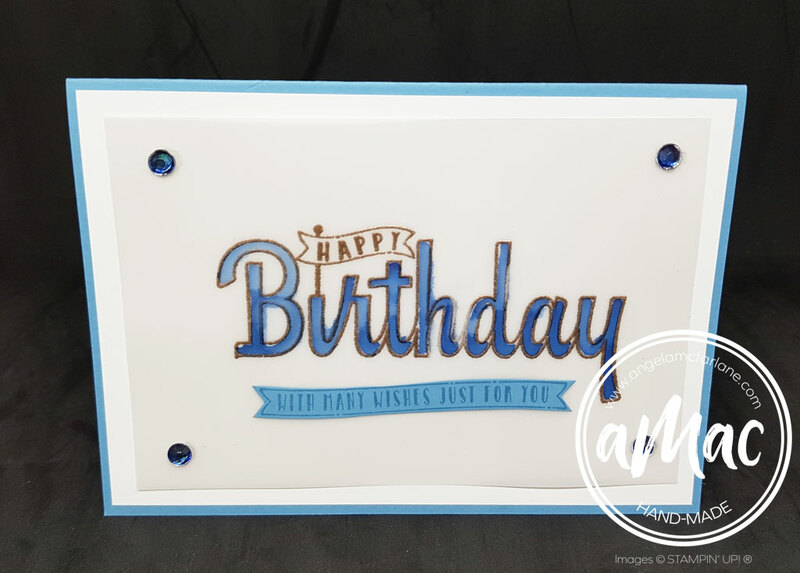 Then the greeting was stamped and the white accents were stamped on scrap, fussy cut (fancy word for: cut out using scissors) then they were popped up on Dimensionals. 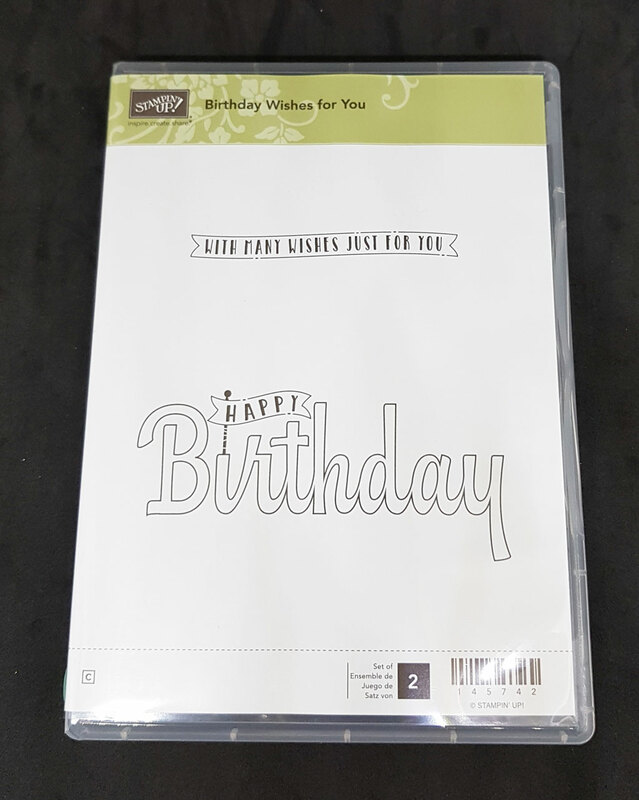 The ribbon was attached, then the front was attached to the card base. Click on ‘Supply List’ below any of the carousels if you would like a downloadable pdf of the items shown. The fourth card was inspired by Su Morh. 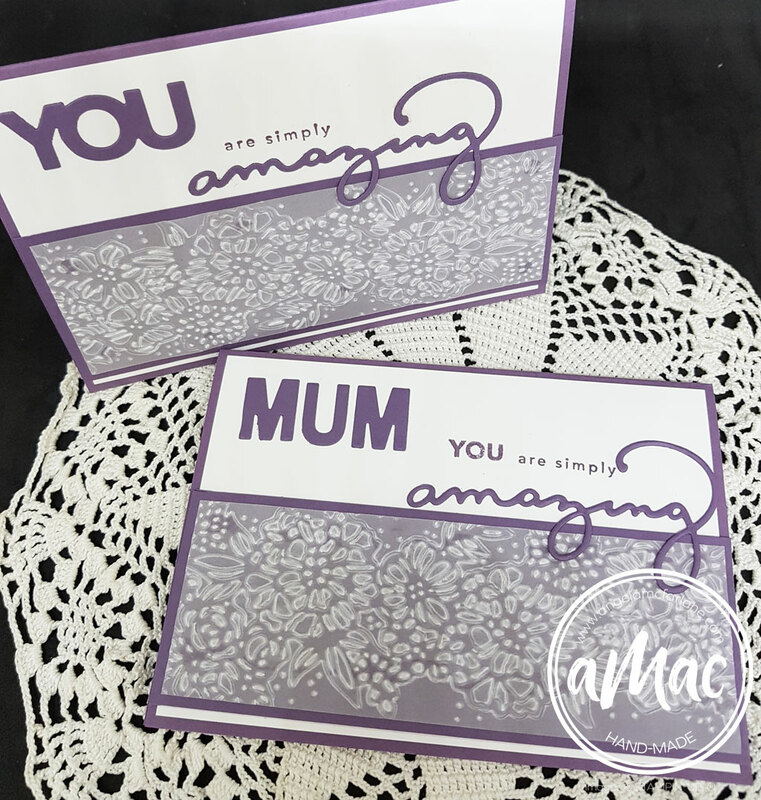 With Mother’s Day approaching, there was the option of making two cards. 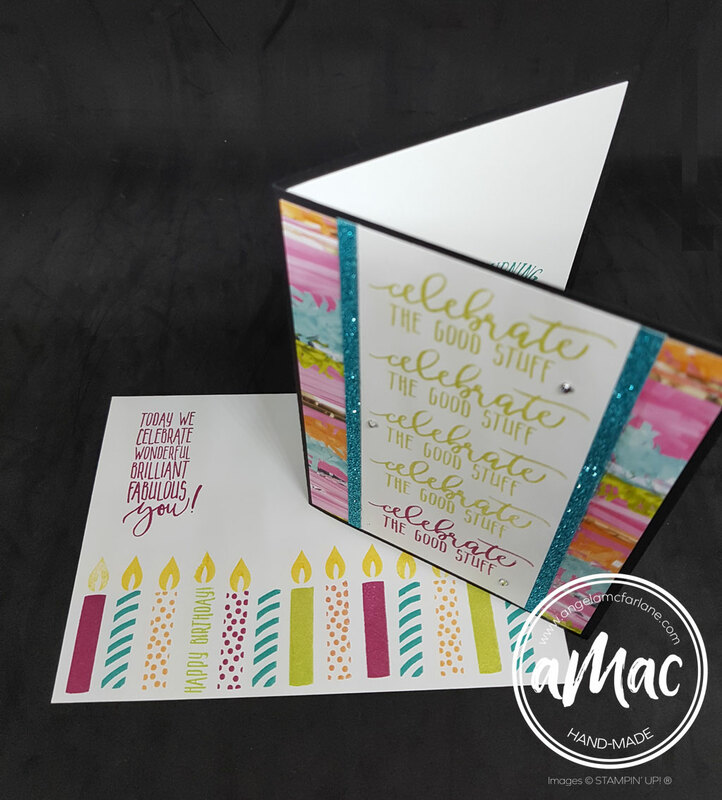 These cards were made by texture embossing vellum and die cutting words from the Celebrate You Thinlits set. 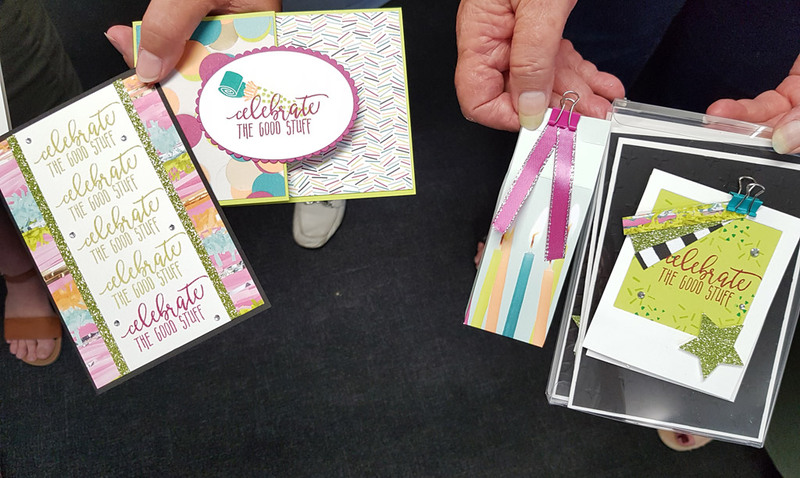 This class was outstanding value for $25 as everyone received the Birthday Wishes for You stamp set valued at $21. I hope you enjoyed this selection of cards. 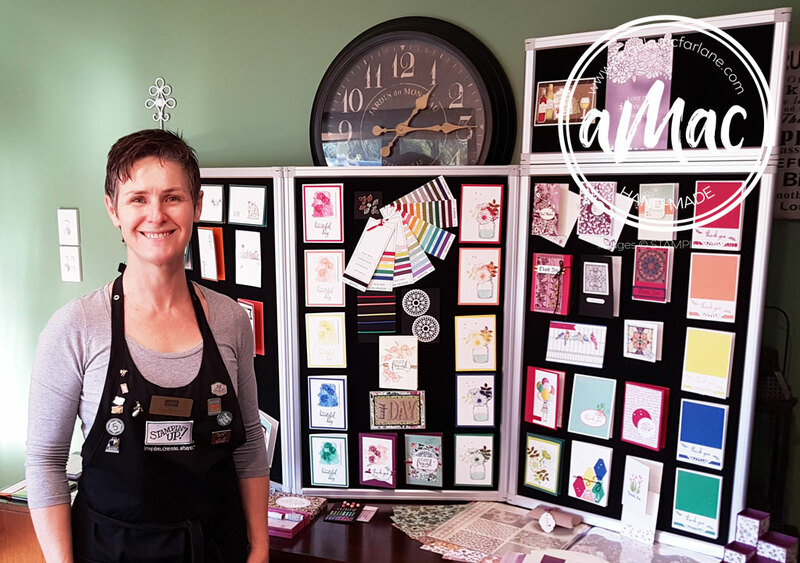 If you would like to join us for our next class, please contact me on 0403 305 785 or email me. 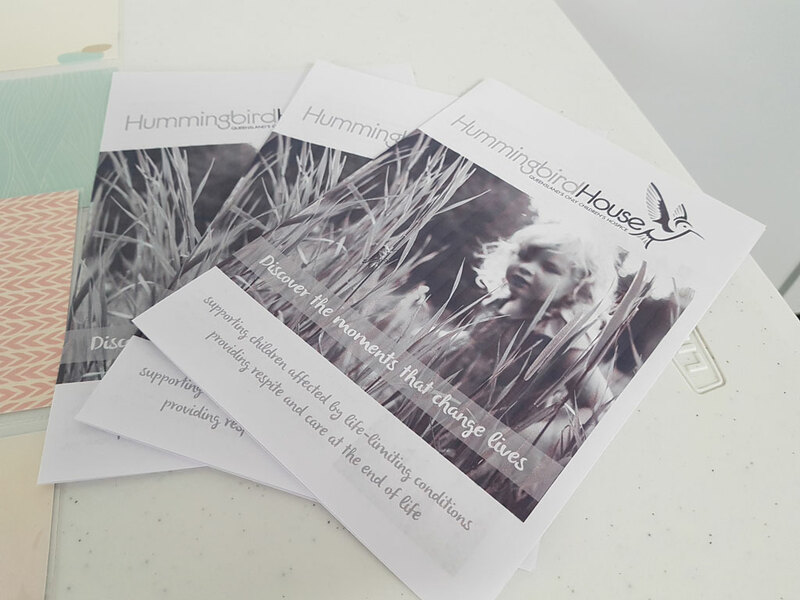 On the weekend we held a charity day to raise money for Hummingbird House. 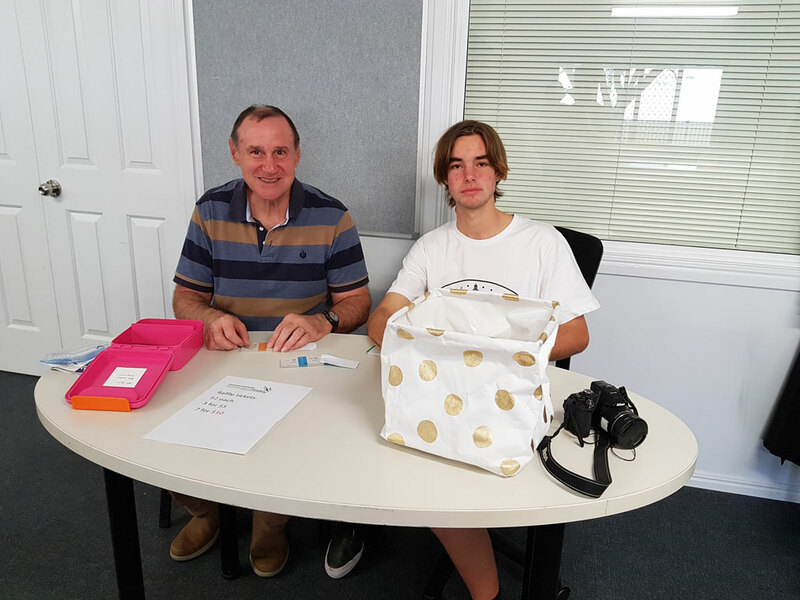 We will be providing them with memory-keeping materials and equipment to help families record special moments. 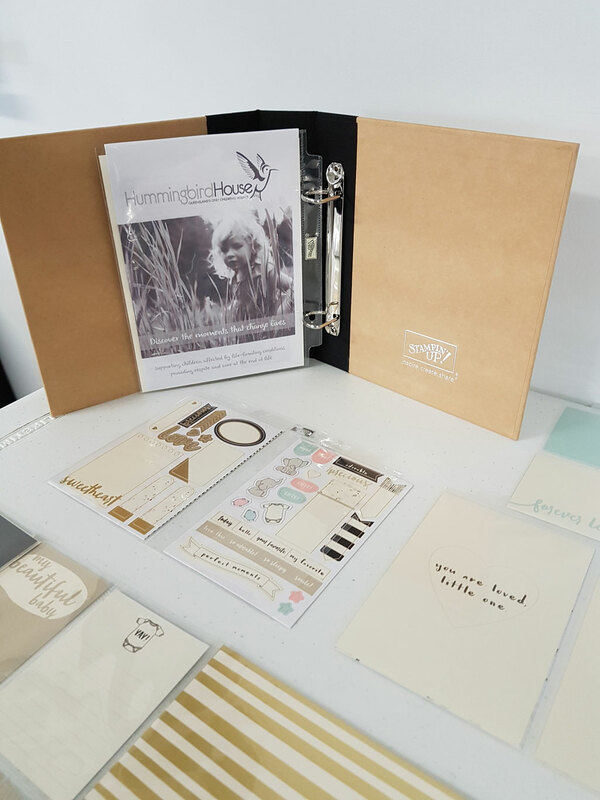 We will be providing Hummingbird House with Stampin’ Up!s Memories and More albums. We had one on display along with some Hummingbird House pamphlets. 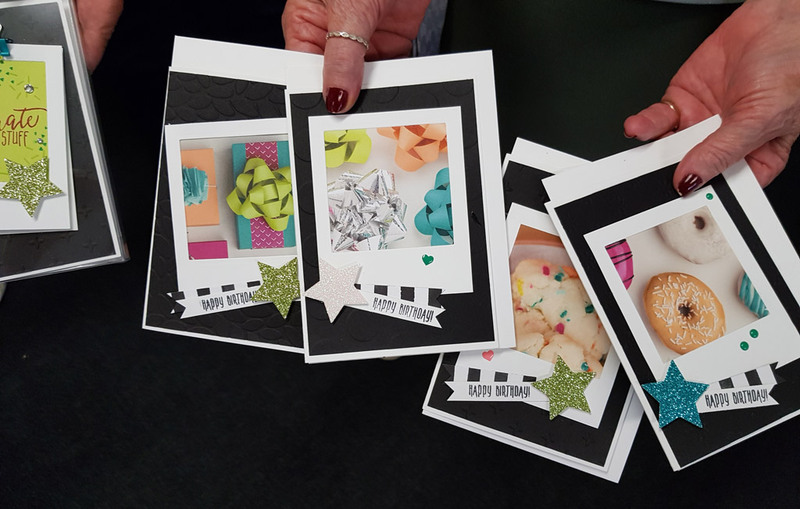 The projects for the workshop were based around the Picture Perfect Birthday stamp set. Here’s a bunch of random shots to show you how much fun was had on the day. We display lots of samples to give attendees inspiration and ideas. Thanks Jenny for your Sale of the Century hand waving. There was an enormous amount of fun to be had! Caroline ran the lucky door prizes. These are the creations the lovely ladies at my table made. 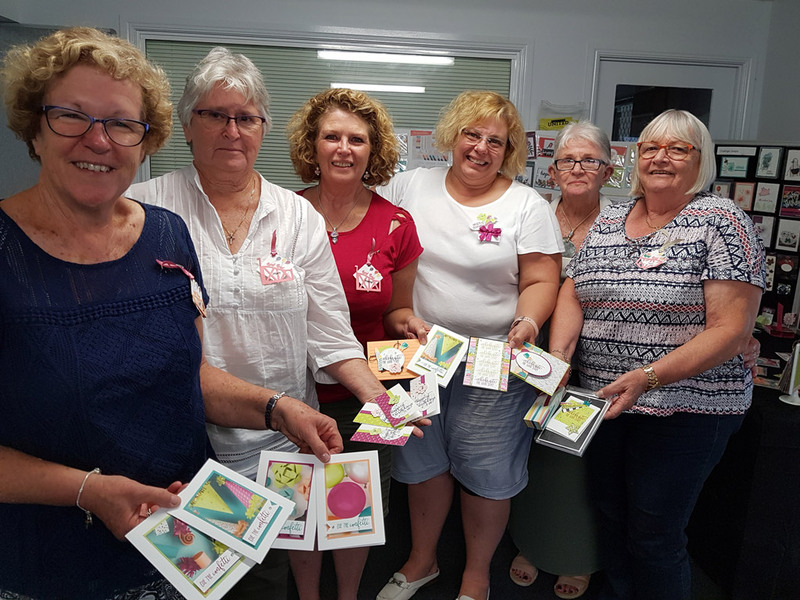 At the end of the day, there were lots of happy crafters and we had a fun day. Anna’s hubby and son pitched in with the heavy lifting and raffle ticket selling. They did a wonderful job as always! Huge thanks to Anna for co-ordinating the day. 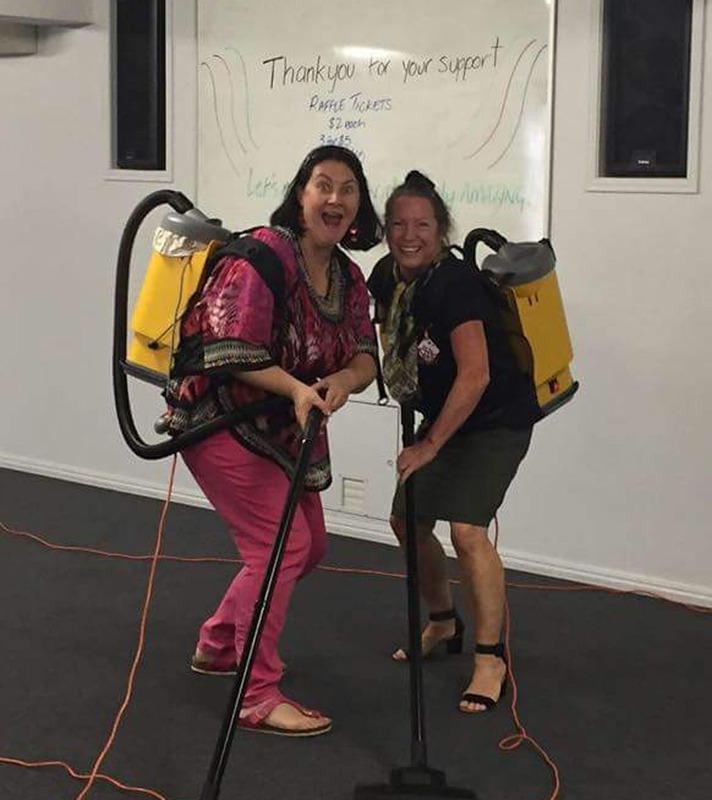 Thanks to Caroline and Debra, even the clean-up was fun!! There were also lots of helpers in the lead up to the day. Thank you to everyone who was involved in making this a fantastic and fun day. 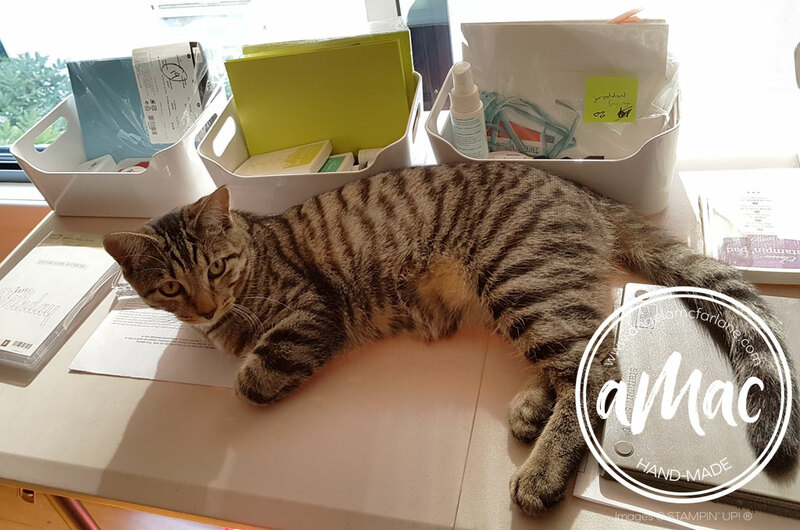 It took a group of volunteers to prepare all the bits and pieces for the kits and then to run the day! All up we have raised $527 for Hummingbird House. 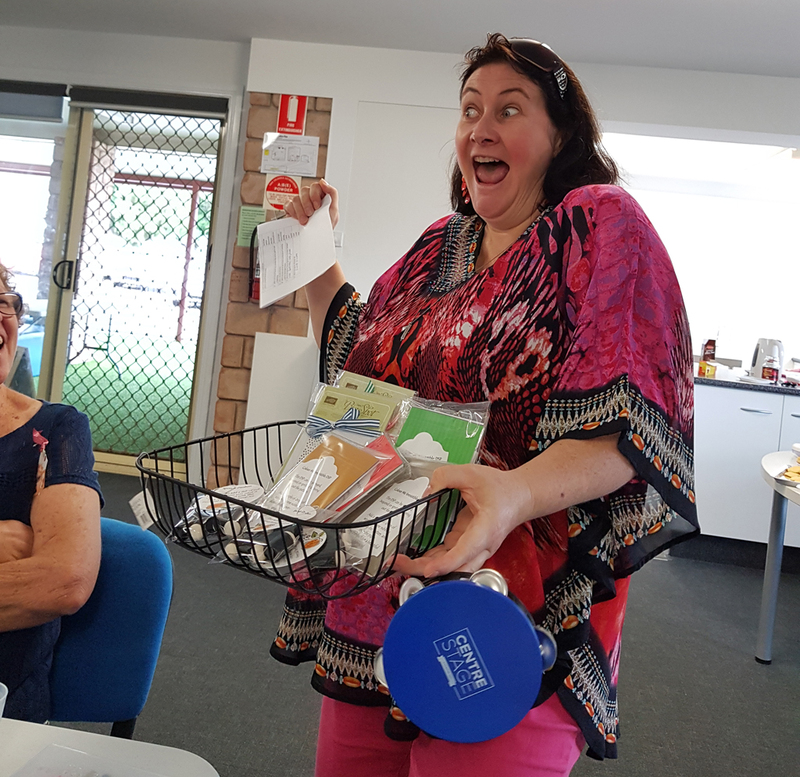 This is the result of the raffle proceeds and two outside donations of $100 and $50. Well done us!! 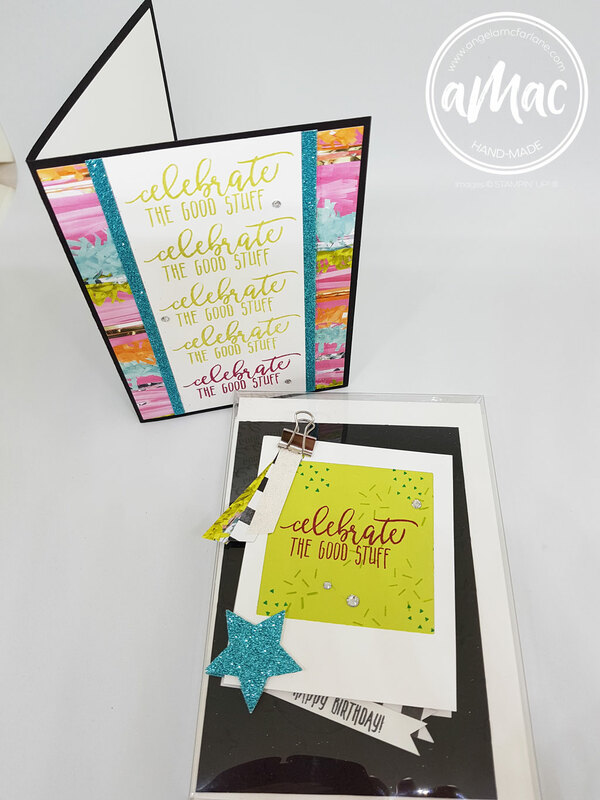 For this week’s class I featured the Lovely Wishes stamp set , which I was given to do a live presentation at OnStage last November. We had a fun class learning 2 step stamping. This is a very forgiving set as the second step images don’t have to line up precisely. 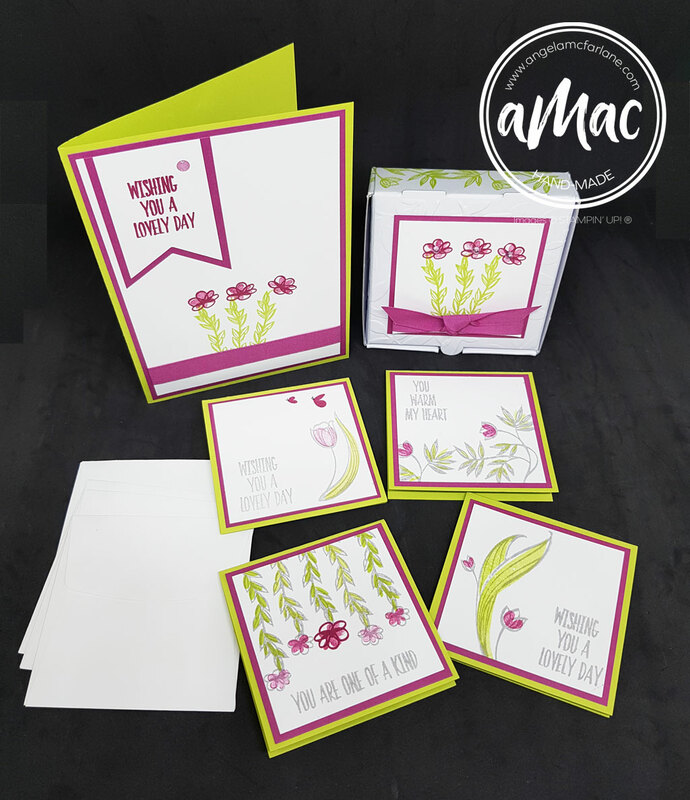 Lovely Wishes is a great set as it has sentiments and images to use to make a complete project. We used every single stamp in the set! 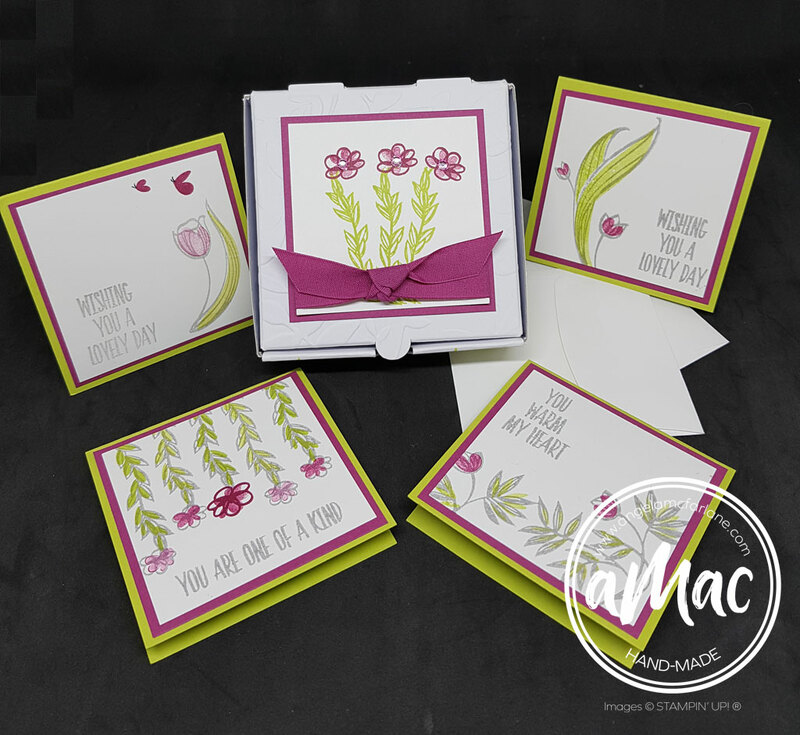 We made a greeting card along with a cute mini pizza box which we filled with four matching mini cards and envelopes. This can be uses as a great gift to give someone special. 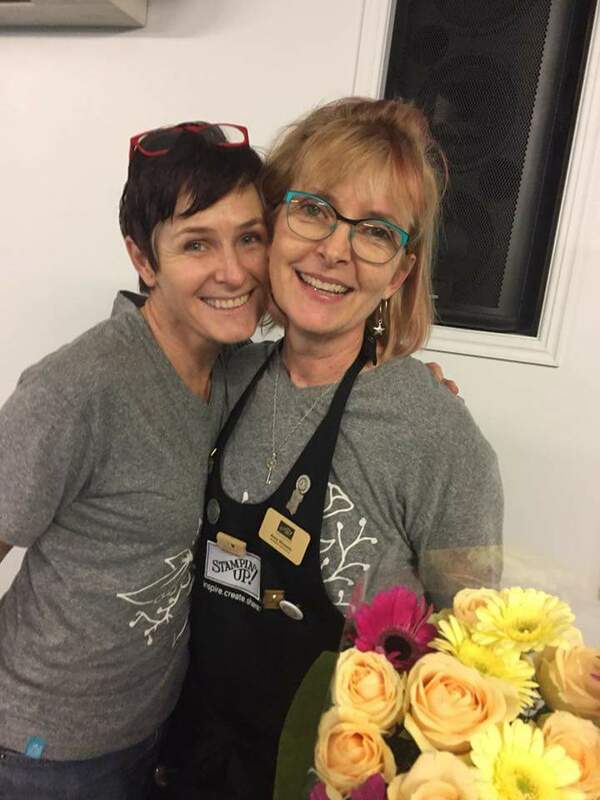 If you’d like to join us for classes, please click the button below for more information.